"I make a lot of cream pies so I am blind baking pie crusts often. I do have ... read full review"
Blind baking is when the crust is baked without any filling. 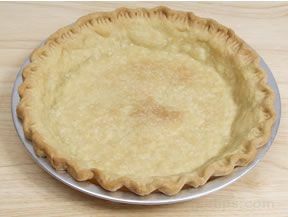 The crust is partial or completely baked before the filling is added to prevent the crust from becoming soggy. Prepare the single crust as instructed in Single Pie Crust and the follow the instructions for blind baking below. 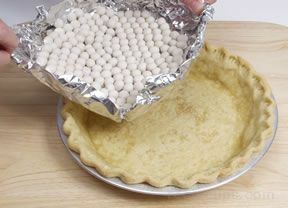 After the prepared crust has been chilled for 30 minutes, remove it from the refrigerator and line it with foil or parchment paper and weight it down with pie weights, uncooked rice, or dry beans. 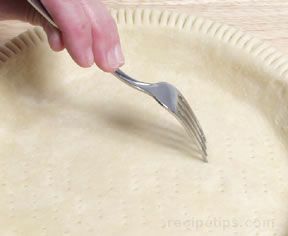 You can also help prevent the crust from puffing up and blistering while it bakes by pricking it with a fork. Thoroughly prick the bottom and sides of the crust before baking. If a single crust is not going to be blind baked before filling, do not prick the crust because the filling may seep under the crust while it is baking. Bake at 350° F until the top edges just begin to turn color. Take the pie crust from the oven and remove the weights and then return the crust to the oven to finish baking. 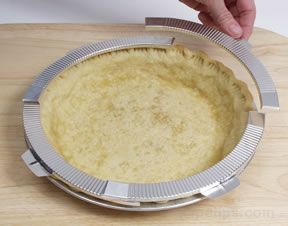 If the edges of the pie crust start to brown too quickly, cover them with pie crust shields to prevent over browning. 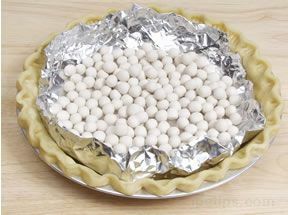 If you do not have pie crust shields, you can make some out of aluminum foil. Bake until the crust is light golden brown. "I make a lot of cream pies so I am blind baking pie crusts often. I do have trouble with it bubbling up on the bottom. I have never tried pie weights but it looks like they might help the bubbling so I think I will try them on the next pie I make."